I set the ballon in an old container while working on it so it wouldn't roll around. For the water balloon, we used a small plastic cup. 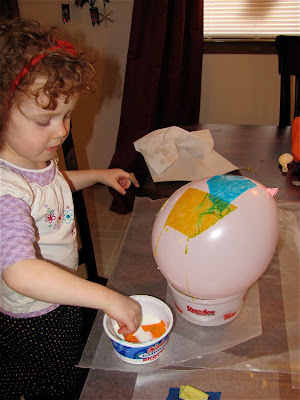 We used two parts glue to one part water for the the mixture to put the tissue paper on the balloons. Make sure to get off the excess glue mixture before applying it on the balloon. Cassie was not a big fan of the sticky glue mixture, so I gave her a wet paper towel to keep wiping her hands. Also, do not use bleeding tissue or your balloon or it will look muddy in color. I mention this because a few bleeding tissue pieces got mixed in with the non-bleeding kind. Do a layer, let dry, and repeat this process for at least 2-3 layers. When they are dry, you can pop the balloon---Cassie really loved this part! 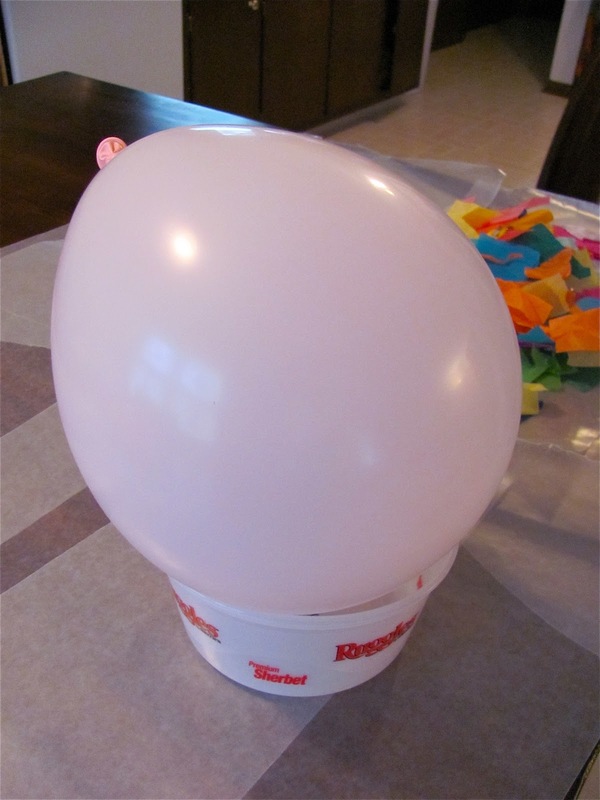 They may be a little flimsy in some areas, but once the ballon is popped ---I found you could blow air back in to them. Kind of cool! The water balloon eggs were not as flimsy. These are gorgeous! One of my favorite cafes in Los Angeles has papier mache eggs hanging from their ceiling. I have no idea why, but they look so cool and your post totally transported me! 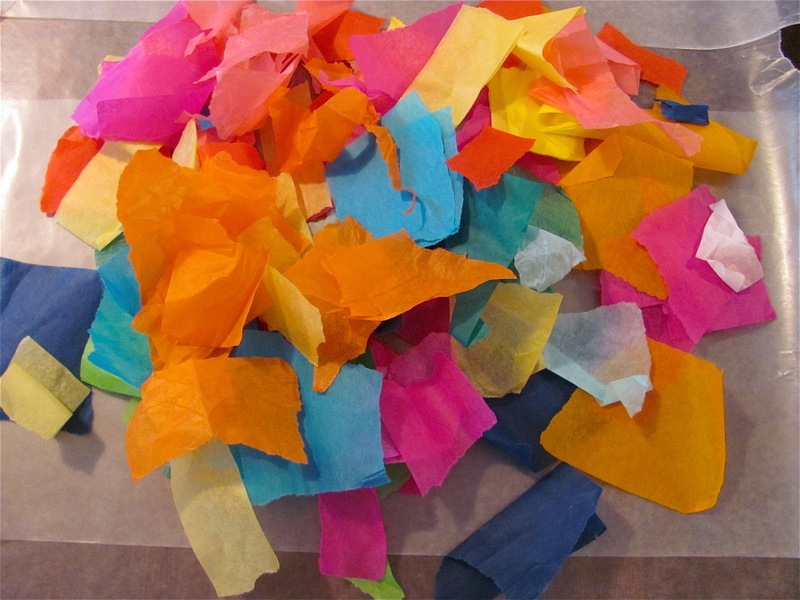 I've been thinking about doing some papier mache with my daughter, but I'm not sure if it'll sustain her interest (she'll be 3 in June). What do you think? Thanks for the compliments! @ The Imagination Tree...now you are! @ Rachelle: I love paper mache and that cafe does sound really beautiful! I think it would be fine to involve your daughter in the process of paper mache. I think just like cooking, we involve our children in some steps---not all----just watching is valuable too! If she wants to participate that would be great! 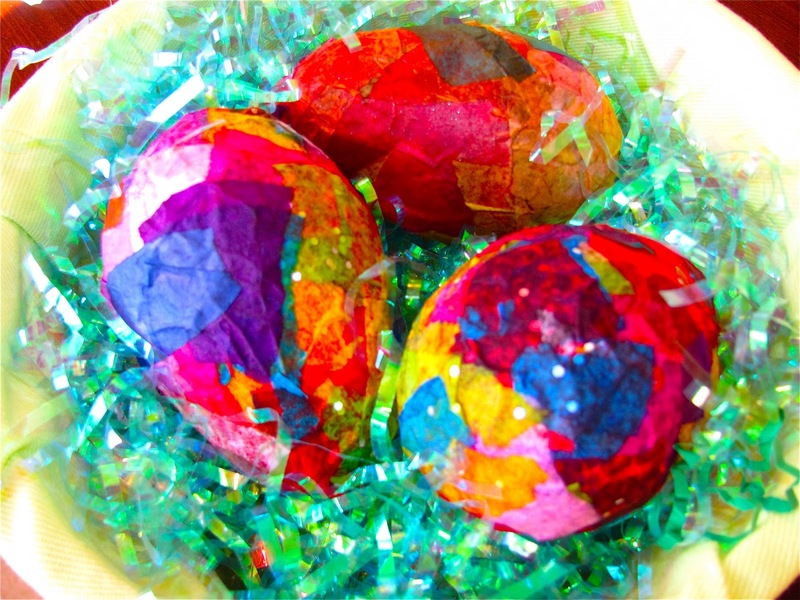 These papier mache eggs are lovely! Brilliant! May need to give it a try! I like how you used the leftover containers to steady the balloon. I often struggle with what to place items on to make it easier for E. I definitely think I will try that! beautiful! I like how you've broken it up into easy steps. I think I can do it!! What a great idea and recommendation about the water balloons! They came out so beautiful! I know my kids will enjoy this! These are beautiful! Great idea. I love how colorful these are. What a brilliant idea. These are just lovely! I always cringe when I hear paper mache, but this post has inspired me to give it a chance. They would look beautiful hanging in our window! I was thinking of a project like this the other day. What a fun project, and beautiful results!! I love it! I love these - and agree there's always the opportunity to sprinkle in some glitter! Thanks for this blog item, I've been searching the web for cane and tissue carnival animals but I reckon I could start this way, many thanks.